Age, wear and tear, accidents, and injuries all affect your teeth. Fortunately, Dr. Pate utilizes advanced methods that make it possible to not only repair problems, but also restore the complete health, strength, and beauty of your smile. He uses his experience and training to carefully consider all aspects of your individual situation, choosing solutions that will improve the function of your mouth, maintain the maximum amount of tooth structure, and create truly breathtaking results. Dr. Pate gives smiles a second chance with crowns, bonding, dental implant restorations, and natural-looking dentures. For those patients who need extensive work or are fearful of dentistry, Dr. Pate can even provide sedation dentistry during the smile restoration process. If your smile needs a little help, be sure to contact us today for an appointment. If you have chipped, cracked, broken, decayed, or even missing teeth, then our team can quickly and effectively repair them using two of the most trusted treatments in all of dentistry: crowns and bridges. 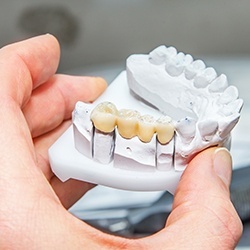 A crown fits over the top of a damaged tooth to restore it both structurally and cosmetically, while a bridge can replace one or a row of consecutive missing teeth. In the end, no matter what your smile needs, we’ll be able to provide it. 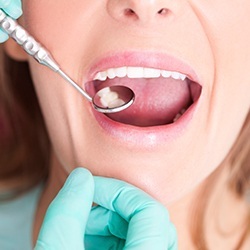 Fillings have been used for decades to repair small cavities and slightly damaged teeth, and traditionally, they were made of a dark gray metal material called amalgam. Our practice uses composite resin-based fillings because the material can be shaded to match the natural color of a patient’s teeth, and it can also be shaped in a way that helps us preserve more of a tooth’s structure while placing it. In the end, they provide a restoration that looks great and is built to last. 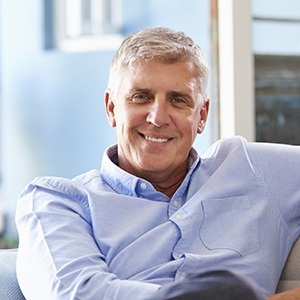 Full and partial dentures are removable prosthetics that can replace multiple missing teeth, and thanks to the latest advancements, they are now smaller, sleeker, and more comfortable than ever. 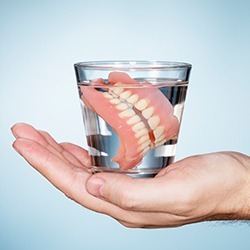 They consist of ceramic teeth fitted to a lifelike, gum-colored base, and whether you are missing just a few teeth or all of them, they can help rebuild your smile and restore your ability to eat and speak with ease. We can also perform simple wisdom tooth extractions in-house as well, though we may need to refer you to an oral surgeon depending on your situation.